Jessica Bills -- Cooking with family over the holidays can bring about the best memories. Who says gingerbread is only for cookies? Enjoy this tasty treat for breakfast. Combine the dry ingredients in a bowl. In a separate bowl, beat the egg, milk, molasses and oil together. Then, mix in the dry ingredients. Spoon the batter onto a hot, greased skillet and cook until bubbles form, then flip. Pancakes should be light brown. If you are looking for an alternative to these made-from-scratch flapjacks, head over to World Market and pick up a package of Baker’s Pantry Gingerbread Pancake Mix. Simply add water, eggs and butter and they are ready to cook and serve. Panera not only has delicious sandwiches but wonderful soups too. Warm up with this recipe on a cold winter day. In a pot, combine the broth, potatoes, onion and spices. Turn to medium heat and boil until the potatoes are tender. Using a wooden spoon or masher, smash the potatoes and reduce the heat to low. Add the cream cheese and heat until it melts, stirring often. 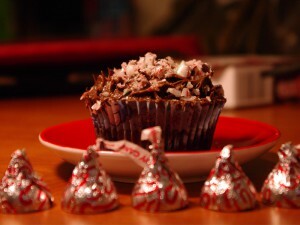 Chocolate is a go-to dessert for many, but by giving it a kiss, it suddenly gets a Christmas makeover. This easy recipe will delight holiday celebrators of any age. Begin by preheating your oven to 350° and prepare the mix as directed. Spray a mini muffin pan or mini cheesecake pan with cooking oil before filling each cup ¾ of the way full with batter. Unwrap the candy cane Kisses and press one into the middle of each cup, leaving just the tip showing. Bake according to package directions. Once baked, let cool before frosting. Sprinkle crushed candy canes on top to finish.